A contactor is a large switch controlled by an electromagnet under software control. It connects the battery pack from connections outside the pack (to the motor inverter, chargers, etc.). There are two contactors in the Model S inside the battery pack – one for positive and one for the negative. This is a clever safety design, because if one fails shorted, software can still disconnect the battery from the outside. 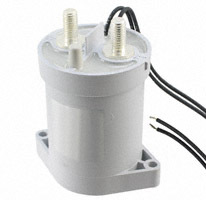 Here’s an example of a contactor that is very similar in style and size to the ones used in the S85 battery pack. Ideally for the longest life, the contactors should be switched when there is no current flowing through it. The Supercharger, AC/DC charger, DC/DC inverter, and motor inverter all are controlled by software, such that normally the contactors are not switched when power is flowing through them. It is designed to handle switching high-current and voltages, but this is not ideal. When powering the motor, it was reported in Tesla’s 10Q that it can draw a peak of 1000 amps (on the S85). From the Ludicrous release notes, it can handle 1300 amps (on a P85/P90) and 1500 amps with the Ludicrous upgrade. When Supercharging, you could have 300 amps at 400 V (120kW) flowing through each contactor. I expect there are conditions where the contactors purposely drop out while high-power is flowing. For example, during a car crash (shock) or if a ground fault is detected (a safety issue) software may release the contractors while power is flowing through it. A software bug might also connect or disconnect while power is flowing. The contactors can handle this, but high frequency repetitive occurrences under load will shorten the life of this part. One contactor specifies a life of about 200,000 cycles when switching less than 50 amps, but only about 1000 cycles at 350 amps. A contactor may be on for hours while driving or charging, and if just powered by 12v can get hot and shorten its life. Tesla uses some additional electronics to supply 12v to engage the contactor, the then reduce the power after than point, as less power is needed to keep the contactor engaged. This reduces how hot the contactor gets, also extending its life. The primary contactors are mounted inside the pack itself, again for safety reasons. It’s located at the end of the battery towards the back of the car. This is adjacent to the external power connection. There are additional contactors external to the battery for switching between DC and AC charging. There have been a few reports of a contactor failing. If failed in the open position, then the car cannot be driven or charged. If shorted, it may be possible to drive the car, but likely Tesla’s software detects this condition and will not let the car charge or drive as half of this critical safety system has failed. A shorted condition occurs when the contacts weld shut. It may not be detectable until software releases the contactor and detects it didn’t release. We do not know the reason for the failures. It may be a batch of contactors was manufactured poorly. Defects may be very hard to detect until real-world usage. The plating on the contacts might be too thin or the spring has the wrong tension. It could even be a software bug on some older software version disconnected the contactor at the wrong point too often. Just like the many other parts that fail (in any brand car), I don’t expect we will ever hear what the exact issue was. The fact Tesla tells us the part failed and/or is being replaced before it fails is better than most car companies. In the last few years, contactor failures appear quite rare. If one contactor fails, I expect Tesla replaces the related pair. While the contactors are expensive, the labor is far more. In the past, the battery is removed and returned to the factory for the repair. Tesla may replace the battery with a temporary battery during this time. Once fixed, the battery is returned to the service center and exchanged for the temporary battery. At the end of 2014 Tesla rolled out a new process to select service centers to make this repair at the service center, avoiding the need to sent the battery back to the factory. Here’s a video (23 minutes) of an owner replacing the two contactors in an older battery pack. It’s far from an easy or simple process, and since you’re dealing with leathal voltages, so I wouldn’t recommend trying this! Just getting the 1000 lb battery pack out of the car is qutie a task by itself. From the disassembly of an 85 kWh “D” battery pack (by wk057), the contactor is a TE Connectivity part 2138922-1, made in Mexico. James Klafehn has another video that shows the contactor as a GIGVAC GV200-004-D.
Tesla sources this part from multiple vendors, so other parts may be used in different cars made at different times. While I’ve been unable to get the exact specifications on this part, a similar TE contactor that handles 500 amps up to 900 VDC costs $120 each in single quantities. The new Ludicrous option upgrades the contactor to a new design. This contactor uses inconel, a high temperature superalloy, instead of steel to work with very high currents that produce a lot of heat.